At the end of another player's turn, Yue Jin can discard a basic card. The character ending their turn must discard a non-basic card or Yue Jin damages them. Yue Jin activates "Valiant" at the end of another character's turn, after their discard phase. When responding to "Valiant," characters with conversion abilities cannot convert basic cards into non-basic cards (for example, Gan Ning cannot use "Surprise" to convert a black-suited Attack card into a Break and discard it to prevent damage). "Valiant" is useful when trying to damage characters with defensive abilities that protect them against Attacks or tool cards. There are some characters with abilities that activate when they discard equipped equipment cards. "Valiant" allows Yue Jin to help them activate their abilities. As previously mentioned, basic cards are Attacks, Escapes, Peaches, and Wine. These are cards that are most commonly used to prevent damage outside of their turns. When Yue Jin discards these cards at the end of another character's turn to activate "Valiant," he is more vulnerable when other characters attack him or target him with tool cards. Likewise, if Yue Jin is targeted by Attacks or tool cards and he responds with these cards to prevent damage, it becomes more difficult for him to use this ability. Yue Jin is weak to card destruction techniques. If enemies remove his hand cards, they are likely to remove the basic cards needed to use "Valiant." Non-basic cards account for 46.4% of the deck, so it is not difficult to avoid damage when Yue Jin targets them with "Valiant." Liu Bei/Guo Jia/Xun Yu/Chen Gong/Xu Shu/New Xu Shu - These characters can either give Yue Jin basic cards or allow him to draw cards to help him to more easily activate "Valiant." Sun Shang Xiang/Ling Tong/New Ling Tong - These characters have abilities that activate when they lose equipment from their equipment area. If they are on Yue Jin's team, "Valiant" is useful for helping them to activate their abilities. However, if they are enemies of Yue Jin, they have a large degree of leverage over him as his only ability is not effective against them. Zhang Liao/Zhang He/Gan Ning/Jiang Wei - These characters specialize in card destruction. They can use their abilities to discard Yue Jin's hand cards and make it more difficult for him to use "Valiant." King Yue Jin is a poor king choice. As the center of attention, he will not have basic cards to waste for "Valiant." Loyalist Yue Jin is a poor loyalist. "Valiant" is not powerful enough to combat the rebels. Rebel Yue Jin is probably best as a rebel, but he is not outstanding in this role. Since the king is the center of attention, "Valiant" may catch him/her off guard. However, with a three-card bounty on his head and an ability that requires him to spend the cards that keep him alive outside of his turn, he may not last long. Spy Yue Jin is a poor spy choice. "Valiant" does little to affect the game and it makes it more difficult for him to respond to Attacks and tool cards. 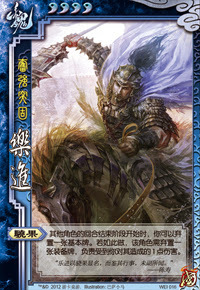 The original Kingdom Wars version of Yue Jin's "Valiant" forces the target to discard an equipment card, not any non-basic card. For some perspective, non-basic cards account for 46.4% of the deck, whereas equipment cards are a sub-category of non-basic cards that account for 15.6% of the deck. While the original ability is powerful, it is not without weaknesses (as listed in the 'Weaknesses' section). The original version of this ability may have been very difficult to avoid, but it also put Yue Jin at risk since he is losing basic cards each time he activates it. This new version of the ability multiplies the number of cards that an opponent can discard to avoid damage by about three, making this ability nearly useless and giving players essentially no reason to select this character.